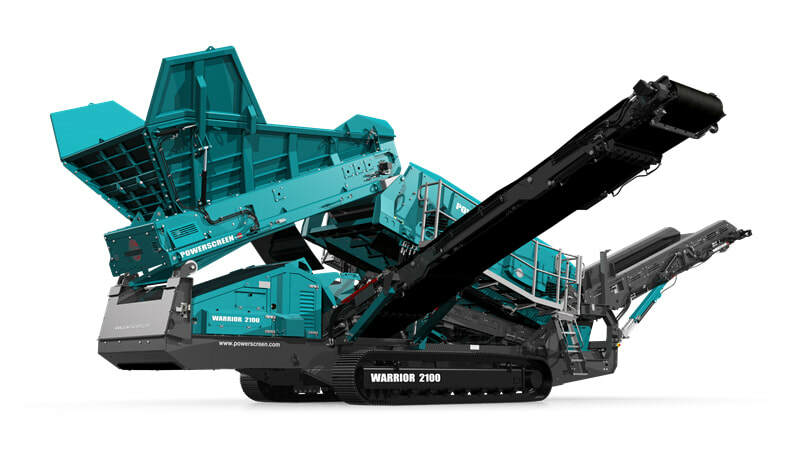 The Warrior 2100 is features the superior Triple Shaft technology which is unique to Powerscreen heavy duty mobile screens. The triple shaft design ensures that the 16' x 5' screen box is exceptionally efficient while maintaining high throughput productivity. The Powerscreen Warrior 2100 sits within the same transport envelope as other machines in the 16' x 5' class, but it has been proven to perform at a world-class level and outperform any conventional single shaft 16' x 5' screen. It is designed with fuel efficiency as a priority, with reduced fuel consumption being achieved through enhanced hydraulics and a lower engine running speed of 1800rpm. Optional on-board Envirotrak systems provide further energy saving technologies like Fuel-Save and Dual Power mode. A variety of media solutions mean that the Warrior 2100 is highly efficient in screening, scalping and recycling applications. It can process mixed demolition waste including soil, concrete, grass, asphalt and wood.